Contemporary ice cube trays are arguably one of the most overlooked gems of the modern kitchen. If you have a refrigerator that produces its own ice, you may not even be aware of how far ice cube trays have come and how useful they can be in creating something other than ice. Trays are now available in many different styles, ranging from the traditional rectangular shape to the one-inch square to the cocktail-style two-inch sphere—and there are a variety of decorative shapes, as well. And the ones made from baking-grade silicone neither melt nor crack, making them a respectable vessel in the kitchen. 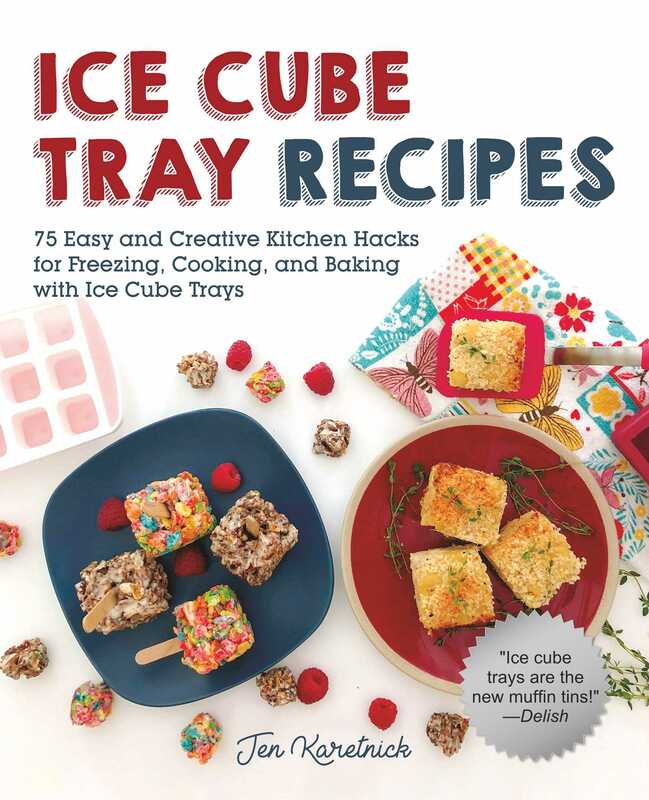 Ice Cube Tray Recipes teaches you how to use these trays to create everything from infused ice cubes to one-bite appetizers and even mini main dishes that will impress family and friends of all ages and keep the mess at bay. In chapters that include everything from soups and smoothies to canapes and sweets, you’ll find recipes for every meal of the day. From the useful to the novel to the downright intriguing, each recipe offers a suggestion of the best ice cube tray to use but also allows for adaptations to traditional, regular-sized trays and novelty trays. This is the fun and inspirational book for home cooks who adore kitchen hacks and trendy entertaining and who like to experiment with new ideas. Jen Karetnick is a Miami-based writer, poet, dining critic, and educator. She is the author or coauthor of sixteen books, including the award-winning cookbook Mango and The 500 Hidden Secrets of Miami. Her latest book of poetry, The Treasures That Prevail, was a finalist for the Poetry Society of Virginia Book Prize. She is co-founder/co-editor of the literary journal, SWWIM Every Day. Her freelance work has appeared in various outlets including TheAtlantic.com, GoodHousekeeping.com, Guernica, Miami Herald, Southern Living, Today.com, and USA Today. Find her on Twitter @Kavetchnik and on Instagram and Facebook @JenKaretnick. This is the fun and inspirational book for home cooks who adore kitchen hacks and trendy entertaining and who like to experiment with new ideas. Recipes include Baked Baby Stuffed Artichokes, Candied Bacon Twists, Chicken Pot Pie, Creamed Corn Muffins, Oreo Mini Cheese Cakes, and more! Jen Karetnick is a Miami-based writer, poet, dining critic, and educator. She is the author or coauthor of sixteen books, including the award-winning cookbook Mango and The 500 Hidden Secrets of Miami. Her latest book of poetry, The Treasures That Prevail, was a finalist for the Poetry Society of Virginia Book Prize. She is co-founder/co-editor of the literary journal, SWWIM Every Day. Her freelance work has appeared in various outlets including TheAtlantic.com, GoodHousekeeping.com, Guernica, Miami Herald, Southern Living, Today.com, and USA Today.